Int 2,7mm with eyes seats. Conehead fits with small and xsmall plastic tubing. 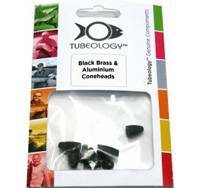 Micro conehead fits with xsmall plastic tubing. Conehead fits with large plastic tubing. 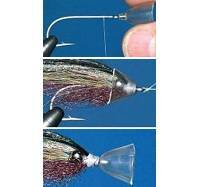 Another nice and easy way to give a finishing touch to your fly. Because of its engineered shape, the soft wing of the fly will look "alive" in the turbulance left by the monster conehead. 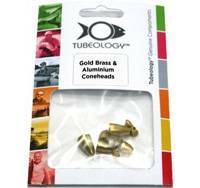 Replacement coneheads can be purchased for any of your Tubeology systems or as add-ons to an existing system. 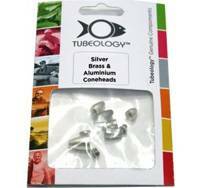 This pack contains 9 heads brass and aluminium. It has one of each size in the pack. Note the images are to show colour selection not size! Note the images are to show colour selection not size ! These brightly coured heads will add a new dimension to any tube fly. Specially designed to fit together with the scandinavian style tubing. All sizes have a 2mm bore to fit on tube fly tubes. Packet of 10. Without a doubt a must for every fly tyers everywhere. Used in a number of different patterns. 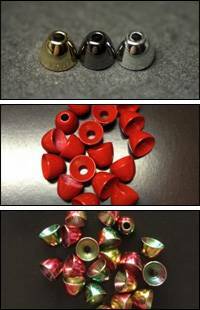 With tungsten being 40% heavier than lead the beads can be smaller for those delicate nymphs and don't forget the cone heads for Salmon anglers. 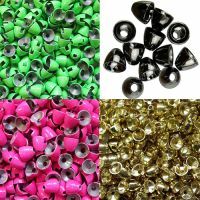 Choose from gold, black, lime, yellow, orange and pink. Sizes 5 x 4mm and 5 x 5mm.